OK so not everyone in America has thousands of dollars to spend on clothes but should a person who can afford such clothes be given a back handed slap upside the head for looking good on national television while running for the President of America? 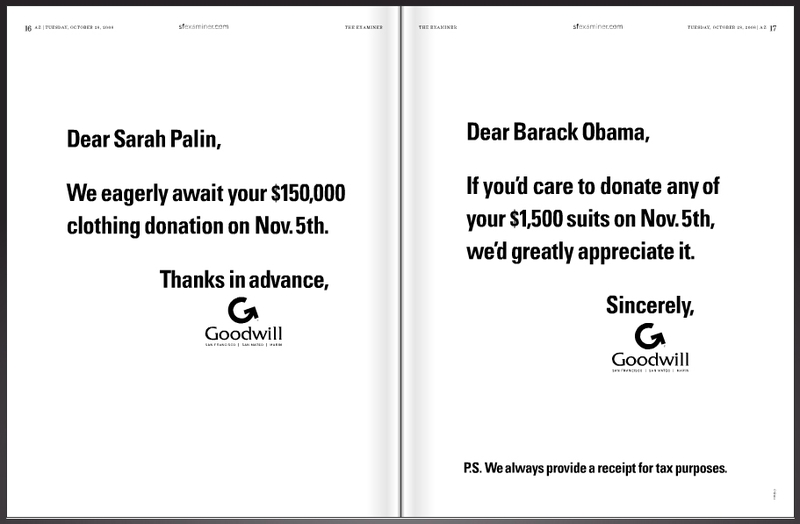 It would appear that's what Goodwill is doing to Barak Obama and Sarah Palin in a new ad campiagn asking them to donate their clothing on November 5th when the Presidential dust has settled. To be fair, Goodwill, along with submitting this campaign, writes, "As a reminder, Goodwill is inclusive, apolitical and non-religious - we just like to take advantage of the dialogue out there to move forward our own mission: Goodwill creates solutions to poverty through the businesses we operate. When people donate to Goodwill, they fund our core mission of providing job training programs for those who have barriers to employment. In tough economic times, it is often the working poor and their families as well as those living on the edge who suffer most. Goodwill is dedicated to empowering them with the skills they need to succeed in today's challenging economy. We thank all of those whose donations help us to achieve this goal." Thanks for pointing this out - I sent them an email suggesting that their advertising dollars (if in fact they paid for this double-page spread) were spent in bad taste. Clever is not always smart. This tasteless "jab" communicates nothing to either their contributors or their target community. In fact, if I were a contributor, I'd wonder if my dollars were being spent on this political tripe. This is opportunistic, plain and simple. They will get notoriety, but they have surely lost some credibility - they have with me. I don't see these ads as any kind of real jab to the candidates. The idea is quite clever, jumping in while the news is hot. What's so tasteless about taking a current news topic, one about clothing expenses, something quite innocuous if you ask me, and using it for your cause? i think they screwed up a fine idea by complicating it. palin_goodwill.jpg would have been much better received. "The American economy is a behemoth of progress, an extraordinary engine of progress and prosperity if it is left to work its magic. The confiscatory taxes and trade barriers pushed by Barack Obama are economy killers --and there is no doubt about this! The record of a quarter century tells us that economic growth cannot be taxed into existence, and that "spreading the wealth" decreases sharply the amount of wealth available to spread. "We are in a recession. A McCain victory means a short and shallow recession. An Obama win means a long and perhaps deep decline in economic activity. "If your retirement plan has plummeted and you want your money back. "If you suspect your home is worth less than it was in September and you want the old value back. "If you wonder what careers will be open to your children and your grandchildren, and whether the country's military and national government will work to keep those children and grandchildren safe, and you want assurances on both counts. "Then you have to vote for John McCain." "If you suspect your home is worth less than it was in September and you want the old value back....Then you have to vote for John McCain." That is the biggest load of BS. Seriously? It's the Republican politics and greed that got us where we are at. McCain can't do anything about your house values. You need to look at the lenders who gave people loans they couldn't afford. And frankly, the people that got those loans are just as responsible. Ignorance is not innocence.